Although American University is known as a very LGBT-friendly school, students Rin Ryan and Sasha Fernandez (both bi) said there was a lack of representation in student media. So they decided to do something about it. Bisexuali-tea is a bi-weekly, 30-minute podcast where each episode finds the two discussing topics related to being queer in college. They start with a tea of the week and a preview of the conversation, then share stories with each other and ask questions. The second episode will be released Oct. 30 on Spotify or online (bisexualiteapodcast.transistor.fm). It’s part of American Way of Life Magazine, an independent AU publication dedicated to critical journalism. 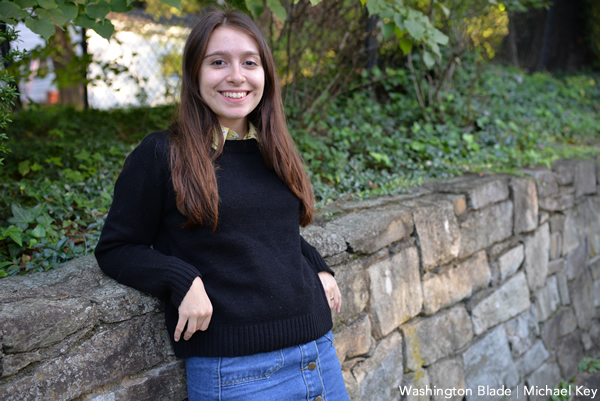 Fernandez lives in Tenleytown and enjoys podcasting, baking and listening to music in her free time. I have been out since fall of my senior year of high school. The hardest person to tell was my mom because she was the first person to know. Emma González because she is a Cuban bisexual, like me. Town was such a fun place to go with friends and see all the drag performances. It was one of the queer nightlife spaces available for adults under 21. I don’t have a dream wedding. When Lady Gaga wore a meat dress to the 2010 VMAs. That everyone follows the golden rule and treats others how they would like to be treated. I do not post on Facebook and my last tweet consisted of me attending an event about Sino-Russian relations at Georgetown University. I would campaign to prevent minors from sexual conversion by their parents because identifying as something other than cisgender or heterosexual is perfectly valid and there should be no reason to change who you are. Ghosts are real. I’ve had too many supernatural events that cannot be explained. To make sure the movement is intersectional, specifically representing transgender women of color that are most vulnerable to violence. That LGBT relationships never have a happy ending. In most LGBT movies, many of the characters do not end up together because of illness or other relationship issues. However, LGBT relationships can last for life. Does “The Rocky Horror Picture Show” count? I wish I wasn’t so insecure and worried about the future. Washington is the city for those who are passionate and motivated.